Casa Armstrong Poventud was built in 1899 as the home for a well travelled Scottish banker and businessman (Carlos Armstrong Toro) who was also the Danish consul in Ponce. Majestically designed by Manuel V. Domenech, the same renowned Puerto Rican architect that later rebuilt Casa Paoli , and who became Ponce Mayor in 1904. Centrally located right in front of the Ponce Cathedral , Domenech used the most advanced objects of residential utility of that time such as electricity, bathroom and kitchens that functioned with an automatic plumbing system, to create a graceful Modernist structure characteristic of the end of the Victorian era. 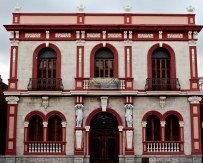 The residence is often referred to as “Casa de las Cariátides” for its Art Nouveau caryatides statuettes in the frontal facade, audaciously boasting smiling young ladies with modern hairdo and bodies in motion, instead of the solemn expression of the more traditional classic styled ones. The interior of the house emphasizes a multiplicity of styles, epochs, and countries: a Chinese jar, Victorian lamps, Austrian glass chandeliers just to name a few. The Residence was converted into a museum and serves as the regional headquarters and bookstore of the Institute of Puerto Rican Culture. Casa Armstrong Poventud is one of many Ponce properties listed in the US National Register of Historic Places. 787.813.2549 – WED thru SUN (8:00am-4:30pm) – USD$3PP. Historical data in this page taken from Wikipedia under their Creative Commons license terms.